500 gallons of Glycol-water mix was dumped after the pipe broke. 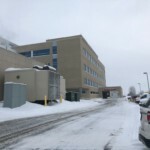 FARGO, ND — Fargo Firefighters are on the scene at Essentia Hospital after a boiler pipe broke. Firefighters are working to clean up the mess. The steam from the Glycol water made it look like a fire. Firefighters tell our reporter Maggie LaMere that they are also working to get heat back for the building.